The process of moving into your new Aston Home is an exciting time! Ensuring that all family members – furry friends included – are prepared for their big change can reduce the moving stress significantly for all involved. 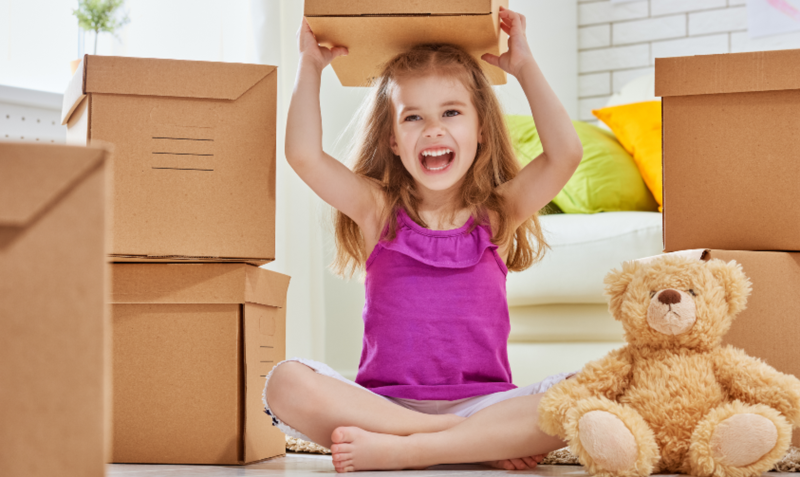 In this Aston Homes blog, we share our tips to help prepare your family for their big move! The most important step in making your family move a smooth one is clear communication. Adults – and children – each will have a unique emotional reaction to leaving a familiar environment (and there may also be some mixed emotions). Some may be particularly excited about the change, while others may experience feelings of melancholy and confusion. Keeping everyone in the loop and discussing the impending move in detail will help people process the change in stages. If you’re moving with young children, we suggest introducing picture books about moving house into your reading routine. The Spruce have provided a list of story-time recommendations to help children feel more at ease in the lead up to moving day. An impending move provides a stellar opportunity for a thorough spring clean! Declutter your kitchen cabinets, pantry, wardrobes, garage and everything in between. Rather than undertaking this task in one tiring hit, we recommend tackling an area or two at a time. Give your new home a fresh start by ridding yourself of unwanted pieces, which ultimately makes the packing process easier, too. You could make some extra money by selling items on websites such as Gumtree, eBay and Facebook Marketplace, or via community trade groups. Alternatively, hold an old-school garage sale or consider donating goods to your local charity. It’s helpful to include children in your moving process. In the weeks prior to moving day, we recommends introducing children to their new neighbourhood, taking time to familiarise them with local shops, playgrounds, parks and libraries. Allow them to envision how their bedroom and play spaces will look in the new home. You may also consider taking them shopping to choose a new item for their new room such as a print for the wall or new doona cover set. Ensuring kids participate in the packing process is also fundamental – help them pack a personalised goodie box with all their favourite items. Keep this box handy for the first few nights spent in the new house to help little ones settle in. When moving day arrives, be as prepared as possible! Organise transport and additional support in advance and consider enlisting a friend or family member to care for younger children whilst removalists are working. After a long day’s move, have an easy dinner organised for the first night in your new home. Maybe even order a sneaky Uber Eats treat? Moving into a new home can be confusing for pets, and it’s important to consider ways to familiarise them with their new space. Bring toys and their bed with you to give a sense of familiarity and safety to your furry friend. Ensure the home is pet-proof, with all necessary gates and fences installed prior to moving day to prevent pets from escaping. If you’re a cat owner, keep your pet indoors for the first few days after your move to stop them roaming. Our primary tip for ensuring a smooth move into your new Aston Home is to make it a positive experience – try to remain as composed as possible amidst the boxes! Experience shows us that getting the whole family involved in moving can make it an unforgettable milestone at the beginning of a new chapter of your life! For enquiries please enter you details below and our friendly staff will contact you shortly.